Whenever I purchase used (pre-owned) tools, I go into the whole affair with a little reservation. Overall, I’ve been very lucky with my vintage tool purchasing, and I really only came across one clunker that was unworkable. Last week I ordered and received a E.C. 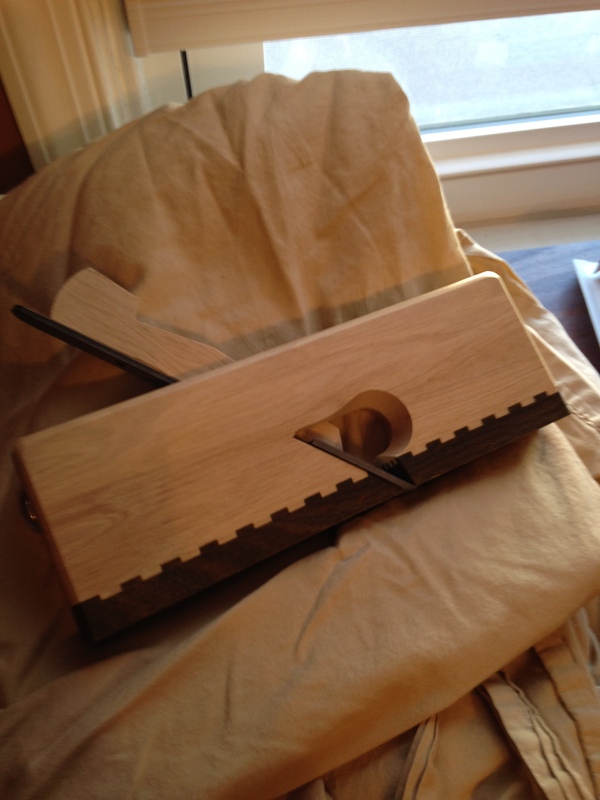 Emmerich shoulder plane from Highland Woodworking. Though I had managed to pick up several tools over the past few months, this is the first new (as in not pre-owned) tool I’ve purchased in quite a while. I went with the Emmerich for several reasons, one being the company’s reputation, another being the cost was within my budget, and most importantly they offered the exact style of rabbet plane I was looking for. This was little bit of a gamble in the sense that there are several respected makers from whom I could have purchased a rabbet plane without reservation. E.C. Emmerich has a good reputation, but they are a bit of an enigma here in America. 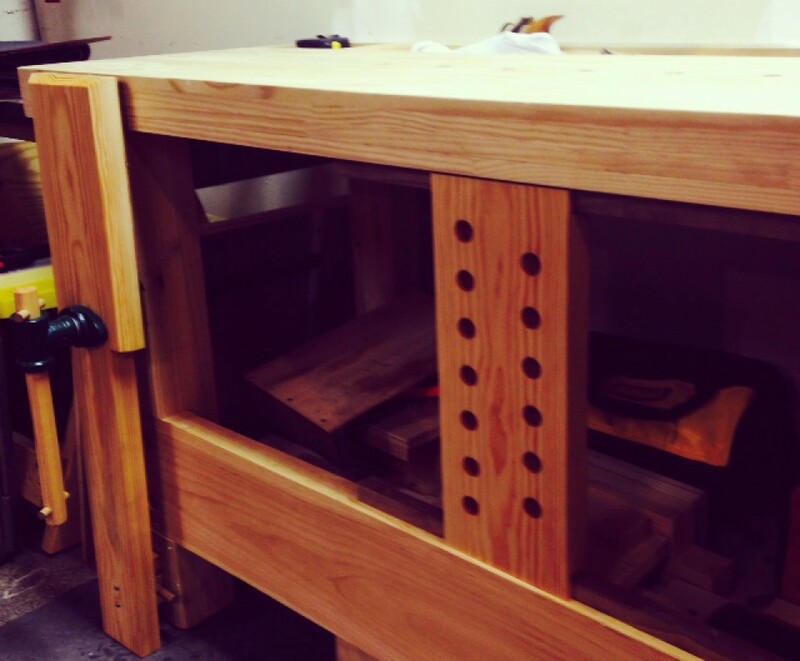 I had never seen one of their tools in person aside from a jointer plane which was in a case, and not touchable. Still, I took the chance, and I am extremely happy that I did. E.C. Emmerich Rabbet plane. Note the large wedge. When the plane arrived I inspected it and to the best of my judgment everything appeared great at first inspection. The sole was flat and smooth, there were no dings or nicks on the plane body, and the iron looked good. I planned on using the plane right out of the box, but at the last second I decided to give the iron the whole treatment. I flattened the back, starting with the “fine” grit on the diamond plate, then using the 1000/8000 waterstones. The back of the iron polished up nicely and very quickly, there is a very minor hollow which I left just as it was. I then honed the bevel using just the water stones. All in all it took less than 10 minutes, and it was an easy going 10 at that. I was impressed with the first honing, a good sign. A crisp, clean rabbet. Note the strike point on the back of the plane. To give the plane a test run I started with a piece of scrap pine. I scored across the grain and proceeded to make a 1 inch wide rabbet. In what seemed like a matter of seconds I had a smooth and even rabbet, easily the nicest I ever produced with a hand tool. The shavings were neat and full width even though I set the depth of the iron just by feel. I then used the plane on the long grain of some walnut. The walnut dado was already started, as it is a piece of scrap I want to make into a screwdriver rack, so I didn’t need to score it. Once again the plane produced a nice, smooth bottom. At this point I am very impressed. Here are some initial findings: The wedge is much larger/wider than a traditional wedge, which I find to be a very pleasant surprise. I don’t have hands the size of the incredible hulk, but they aren’t small either (nor are they as nimble as they used to be). I’ve always had a bit of trouble with the wedges on vintage wood planes and could never seem to get a good grip on them. The shape and size of the wedge on the Emmerich plane make it very easy to handle for those of us whose hands aren’t as dainty as the average person. The iron is also heavier than a vintage iron, which is pretty much common place on most new planes, but the tang is rounded at the top, which to me is smart, as it should help limit mushrooming/deforming of the tang from setting it with a hammer. And one of the more impressive features is the round metal strike plate at the back of the plane. I have never, ever, been a fan of striking the back of a wood plane with a hammer or mallet to retract the iron/ loosen the wedge, nor will I ever be. No matter what, when you strike a wood plane with a mallet you are damaging it and there is no way to get around it. I understand that it has been done that way for hundreds of years, but I would be willing to bet that many planes were damaged or broken in the process. The metal strike plate appears to be a simple solution to an age old problem. I’m not sure if it has ever been done before, but this is the first I’ve seen of it. Lastly, the plane is made of hornbeam, the same wood used in many chisel handles. I love the feel, and though I don’t necessarily like to use the term “warm” to describe it, that is exactly what it is, warm and comfortable in the hand. Though I am less experienced with rabbet planes than I am with other woodworking tools, I like to think that I know a good tool when I use one. This plane is easily the best rabbet, or shoulder style plane I’ve ever used. After using it for just a few hours I am hooked, and during that time I could not find one single complaint. The plane is well made, comfortable, easy to adjust, and it works very well; I couldn’t be happier that I purchased it. This is among the best money I’ve ever spent on a woodworking tool, and only $100 at that, including shipping. E.C. Emmerich may not be as well known in America as other tool makers, but they have a new fan in me. By billlattpa in E.C. 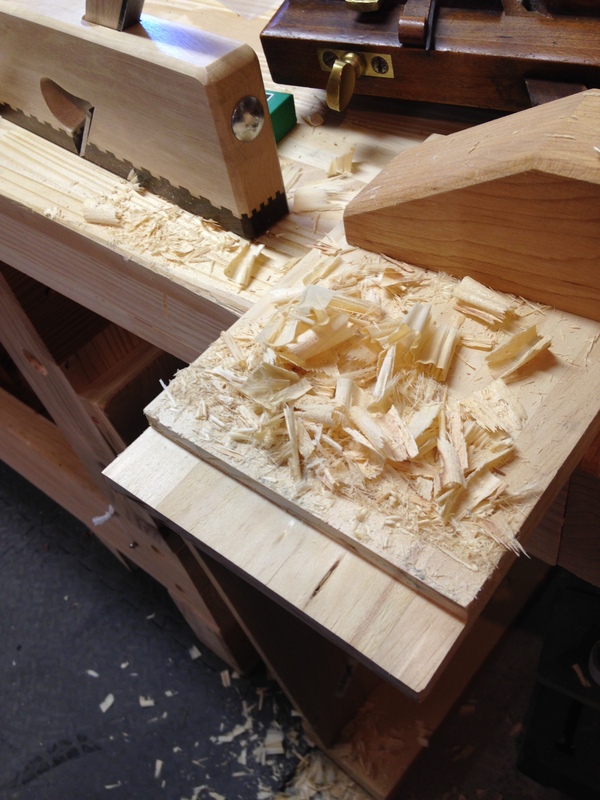 Emmerich, Hand Plane, tool review, woodworking on March 24, 2015 . Sounds like you got a good one there. Looking forward to seeing you use it in a project. I can’t wait to actually start building stuff again. I’m just waiting out the winter. It was 20 degrees this morning; the cold weather just won’t seem to break. Not much can go wrong when a plane has only three parts. Good job you didn’t get one with knobs and levers. I agree, the simpler the better on these tools. If they are made correctly from the get-go they are easy to maintain. I’ve never been a fan of shoulder-style planes. They are expensive and never seem to work exactly they way you want them to. I’ve used a bunch of them from low to high end and every one had their little quirks. The Veritas was the nicest, but it costs an arm and a leg. I’ve said before that I’m not a traditionalist in any way, but in this case I prefer the traditional tool. I am interested by these Bill. I found these http://pinie.cz/en/wooden-planes that seem very humble tools. I have ordered a smoother (I think) for about $30.00. It’ll be interesting to see how well they work. Thanks Graham, this looks very promising. How do you order or get pricing if you don’t mind me asking? I couldn’t seem to find it on the web page. Nice looking plane and good to hear good things about this maker. I too have seen these planes for a long time yet never heard anything good or bad about them, so glad to see a review out there for posterity. Does this have a tapered iron? The iron is not listed as tapered, and it doesn’t appear to be tapered either. I don’t have the plane in front of me right now, but when I get home I will double check. There is a rabbet on the “frog” that the tang sort of falls back into when the wedge is inserted, and I think that helps to seat the iron more tightly, though I am just guessing. When I used the plane I set the wedge with just hand pressure and the iron didn’t budge. Time well tell how well it holds, but so far so good. I suspect it will work well. Philly planes doesn’t taper his irons and he has many happy customers. At some point I read (probably from Larry Williams) that tapered planes in side side escapement planes are in part so the irons couldn’t get stuck in bodies as advancing the iron would aways lessen the wedging. This is in regards our previous discussion of “user” molding planes, as I think the irons (including tapering) are the biggest impediment.